hedgehog. | Our Sweet K.
Landon told us he had a great first day at school! His friend Brayden rides his bus, so that made him excited I think. He didn’t really tell us much about his day at school; that’s just the type of kid he is. When we asked him about what he did, who he sat with, etc he didn’t give us but 1-3 word answers. We expected it though, so I wasn’t too disappointed. My mom, and dad however, probably were. They both called to ask Landon how his day went, and he really just wanted nothing to do with talking to another person about his day. To him, it’s like “what’s the freakin big deal?!”. Shane and I decided that we were ready to tell him about the pregnancy (he mentioned some very sad things to me yesterday night, and I knew it was time to tell him). While we were all at the table eating lunch, I told him we had something to talk to him about. I was nervous and didn’t really know how to approach the situation because we were just here about a year ago with him. When we told him about Kenley, he was so excited. I have it on video, and I don’t know that I will ever be able to watch it again. This time, he was very excited as well- but it was different. I ended up just showing him the ultrasound picture, and he sort of gasped. Shane and I smiled and waited on him to say something. I can’t really remember what he said, and what we said, but he was so excited. We told him that we were pregnant again, and we were going to have a baby. After her processed it for a little while, he looked right at us and said ” You guys were being secretive lately, so I already knew”. I am not even kidding you, those were the EXACT words out of my 5 year olds mouth. Wtf? Shane and I laughed so hard. It kind of just took some of the stress off of the situation. Landon did ask if what happened to Kenley would happen to this baby, and we assured him that it would not happen again (although, it feels weird for me to promise him something won’t happen again when I can’t help but worry myself that it will happen…). We told him that we would be going to the doctor a lot more, and that the doctor would be watching this baby very closely. He asked us what happens if the doctor sees something wrong with this baby. We told him that the doctors would be taking very good care of us and they will do everything they can to make sure that we get to bring this baby home. I hope that we get to bring this baby home. He was off school today (his school does a staggered start for the Kindergartners) so we hung out as a family for the day. We went to a local coffee house and hung out for a while. 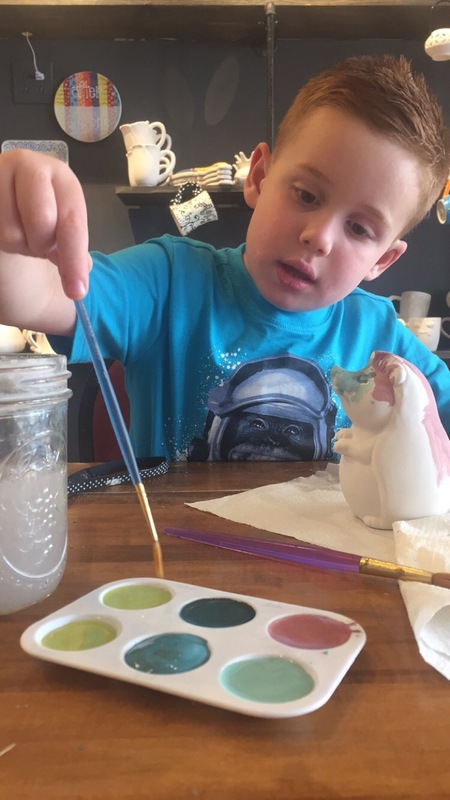 They offer painting of ceramic figures and Landon wanted to paint. He chose a hedgehog and said he wanted to paint it for his brand new baby sister. I think we have a nickname for our little one. Kids are amazing little human beings they pick up on so much. You’ve got a smart kindergartner….I bet it’s just a matter of time and he’ll be talking your ear off about school. Enjoy this special time with him.